TAKEN is no longer a commodity anyone rushes out for anymore. Sure, it’s easy to watch and there is no need to avoid them when they cross your path. But the second one pretty much secured the notion that – despite the first one being really awesome entertainment – the TAKEN series is just a formula. No doubt though, I watched it the weekend it hit HBO because there is nothing wrong with a little formula. I watched TAKEN 3 (2014) on 10.18.15. It was my first viewing of the film. Bryan Mills (Liam Neeson) has settled down in Los Angeles, and things are back to normal. His daughter, Kim (Maggie Grace) has normal people problems like how to tell her parents that she is pregnant. Ex-wife Lenore (Famke Janssen) has real world problems like the fact that her current husband, Stuart (Dougray Scott) bores her and is overly protective of a failed relationship. Quickly, though, tragedy hits Bryan’s life. Having avoided all the previews, I’m not sure if the first big event was spoiled in them or not. But, not wanting to be that guy, I’ll avoid saying what it is here. But it is a legitimate one. It propels the movie to a place of emotional distress, which makes for a better premise than TAKEN 2. But nothing about the plot is remotely believable. First, Bryan runs from the cops because it wouldn’t be a movie if he didn’t. Then, he engages in amazingly dangerous battles with said cops in the middle of busy highways knowing that the only reason noone will die as a result is because this is a PG-13 movie. Then he outsmarts everyone in elaborate schemes that feel written rather than organic, even if the guy chasing him proves smart enough (Forest Whitaker… in a role which is basically the same one he had in PHONE BOOTH, except in this movie he constantly plays with a rubber band and a chess piece). And after all kinds of death and destruction, all is forgiven in the final moments of the film (because Bryan surviving the film and winning is not a spoiler alert). Despite all of that, this is a likable film. 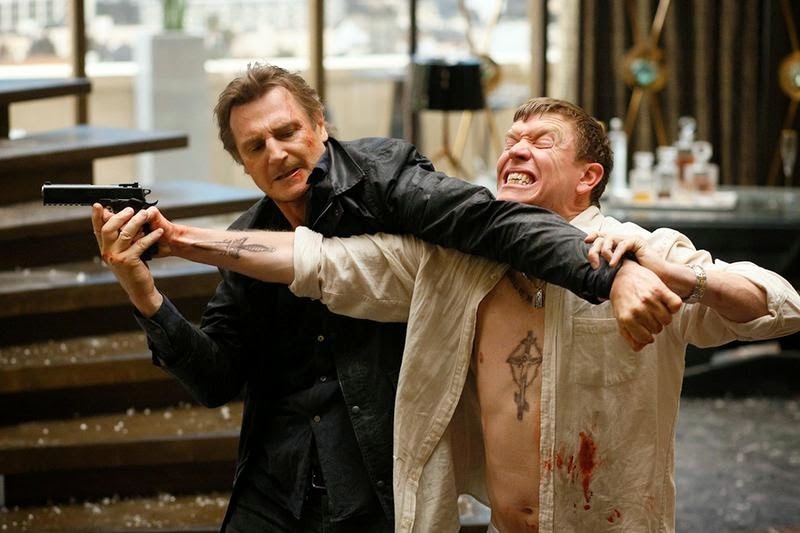 Liam Neeson does all of the things we want him to do. He fights anonymous European bad guys. He drives cars recklessly. He protects his daughter. He uses his particular set of skills. Bryan Mills is a role Liam Neeson was born to play. It is just too bad that the quality of these films doesn’t equal, say, the BOURNE films that gave Matt Damon such an opportunity to shine. That trilogy felt like one which has an arc and a consistency. The TAKEN experience is one of a franchise which realized it had a money maker and was going to make some sequels regardless of wether or not they could hold up to the original. TAKEN 3 is more fun than TAKEN 2. But neither are really in the same conversation as the original TAKEN, which is a modern action classic. At least TAKEN 3 is smart enough to employ a couple of solid actors in Forest Whitaker and Dougray Scott to add to the quality of the Mills family. And it helps that this isn’t a movie that suffers from actors who are unwilling to come back. Janssen and Grace both play vital parts in the story, and neither is an afterthought which checks off a box. While the villainous Oleg (Sam Spruell) feels like the most generic of villains – heck, we don’t really learn anything about him until the movie is nearly over – at least he is not the only one under suspicion. The movie sets up for a fourth installment. And why not. I’d watch it. I won’t expect much of it. But if TAKEN 4 is as entertaining as TAKEN 3, it has served some kind of purpose. ~ by johnlink00 on October 19, 2015. Good review. This movie was terrible. There was no real plot and honestly, it just felt like a total re-work of the first. The second movie, in its defense, was sort of the same thing, but at least it had some real excitement and energy added to the proceedings. This just seemed dour and boring.